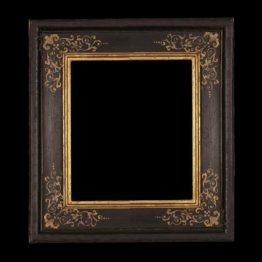 Reproduction of Renaissance Picture Frame with painted gilt decotations on black paint. This Siena 16th century model is available for any particular painting size. | Calculate Price | We Ship it in 60 DAYS from order. Delivery is by DHL courrier. Shipping process lasts about 2 working days for European countries and 5 working days for the rest of the world. The frame is made of ayous wood and Toulip wood perfectly combined together to obtain the maximum strength. This frame is completly customizable in order to meet any client desire. The process of decoration is entirly made by hand. Any single black square is diligently painted one by one giving to this frame an extraordinary and very rich look. This frame fit very well with any kind of Antique style painting. In the last years our customers framed with it several modern painting as well. In conclusion our advice is to choose this frame whenever you want to frame an important painting or whenever you need to own just a beautiful frame.